Our mission is to serve the communities where we live and work, offering quality publications for quality readers. 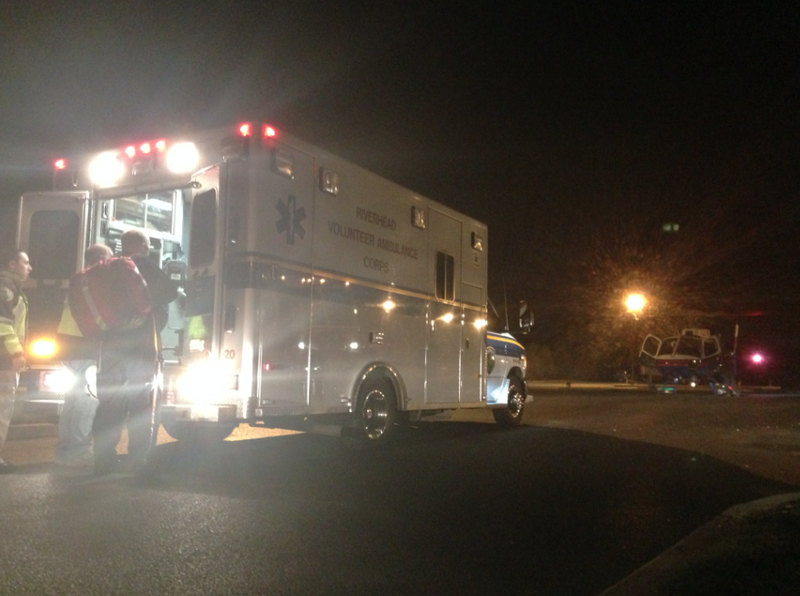 COURTESY PHOTO | Members of the Riverhead Volunteer Ambulance Corps on scene at a crash Monday night in Calverton. A car crash just before 7 p.m. tonight has local emergency responders on site in Calverton and Route 25 closed to traffic. According to Riverhead police, a call for a one-car crash just west of Splish Splash came in at 6:59 p.m., and a helicopter has been called to the scene as a result. Riverhead Fire Department and Riverhead Volunteer Ambulance Corps are on scene for extrication from the car. All traffic is currently being re-routed. Check back with the Riverhead News-Review as more information becomes available. This entry was posted in Uncategorized and tagged Calverton, Car crash, Police. Bookmark the permalink.